Time for a new notebook! I can’t believe how fast I went through Lucca. This new WIP (working title: The Lords of Yesterday) has me scrawling scenes even more than I did in the early days of The Big Rewind. It’s a much different book for me, so I’m letting myself play with POV and scene variation, as well as a TON of beautiful collage work. I’ve really gone kinda crazy, and I regret nothing. Lucca was experimental in paper usage and texture. The map pages were pretty, but writing on them proved useless, so they ended up being collage pages. The parchment was a nice surface and added color, but tended to smudge with the big fat gooey ink pen I use because my hands are basically claws now. I don’t think I’d do the origami paper on the spine again. It looked pretty, but took up valuable page space. My original intent was to make a double-sided journal, like an old pulp novel–on one side, Crime Writing, flip it over, General Work. But I’ve still got about half of Mona left, so the pages would end up being wasted. I needed a new notebook, and I needed one fast, so I put what I had on hand to good use. Arche/SuperCola is very basic in design, but represents the finest of all my techniques combined — multiple paper types, end pages, French stitch and metal accouterments. I had bought the hinges for another project, but they proved to be merely decorative and basically non-functioning. 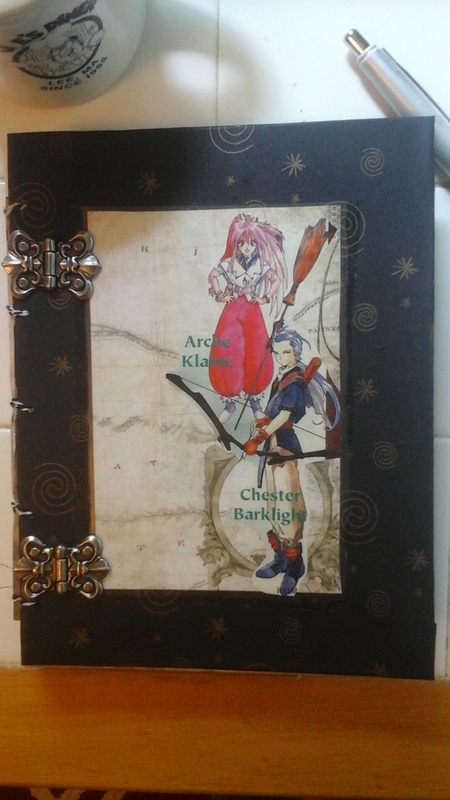 This entry was posted in Book Binding, DIY, Notebooks, Papercraft, Publishing, The Big Rewind, Writing Life and tagged Lucca, Nintendo Power, Notebooks, SNES, SuperCola, Tales of Phantasia. Bookmark the permalink.